Okay. I know it’s been hot and sticky for a few days this week and so far this month we’ve seen our share of 90 or near 90 degrees days(seven, to be exact). And there is probably more on the way. Before we start to complain too loudly, we should know that “this heat ain’t nothin’”. Not compared to 1936, when 80 years ago this month, the Toledo area, and most of the Midwest was under siege by the sizzling and deadly sun. Temperatures soared for 8 days straight well past the 100 degree mark. Toledo recorded its all-time high of 104.7 degrees. At the old Muni airport in Lake Township, the recorded high one day was 107 degrees, while Bowling Green was burning at 110 degrees. And remember, there were few, if any air conditioners. Just electric fans. Stores couldn’t keep them in stock. The resulting oven like temps were blamed for over 70 deaths in Toledo, including 17 patients at the Toledo State Hospital for the Insane. More victims, by the hundreds were rushed to hospitals with heat stroke and collapse. Local towns around Toledo also reported heavy casualty tolls from the broiling sun. Day after day, the toll climbed. The oppressive heat was not just dangerous for humans, but all life withered under its heavy hand. Animals and livestock by the hundreds succumbed from the assault of heat and dehydration. As a result, tallow and rendering companies found themselves working non-stop to clear the dead carcasses from the farms and fields. The mercury rose to levels that the heat triggered numerous spontaneous combustion fires. Barns, grasses and hay blossomed with flame throughout the area. Most startling perhaps was the constant buckling many sidewalks, streets and roadways as the asphalt boiled and the pavement ruptured. Toledo’s downtown streets were not immune to the ravages, as street level temps were recorded in excess of 110 degrees for a week of afternoons. At the Jamra’s Tobacco Company in the 500 block of Monroe Street, the thermometer recorded 119 degrees on the afternoon of July 8th. Further out Monroe Street at the railroad viaduct near Auburn, the retaining walls buckled and heaved in the heat. Even the Toledo city bridges were affected as drawbridges were unable to close properly because of heat expansion in the closing latches. In Ottawa County, brick-paved streets were reported to be bursting in Oak Harbor on State Rt. 19 as the blistering temps caused the pavers to expand and explode. After 7 days of sweltering conditions, state highway officials said more than 550 roadways in Ohio had exploded. Throughout the region many stores and numerous factories were forced to close with the mercury surpassing 100 degrees by mid afternoon. In several incidents, factory workers were reported to be overcome by heatstroke and rushed to hospitals for treatment. Construction workers were especially vulnerable and many had to put down their tools and get out of the blazing sun to seek shelter from the broiling conditions. It was reported that even the hens at local egg farms were so hot, they too stopped work and wouldn’t lay eggs. Another consequence of the scramble to keep cool as thousands Toledo area resident turned to the relief of water. To escape the sweltering misery, they went swimming and many did not return. During this eight day period, dozens of people died from drowning as they crowded the rivers, beaches, lakes, ponds, pools and quarries. Newspapers everyday carried numerous articles about those folks, young and old swallowed forvever by the very thing they had hoped would bring them some temporary comfort. Local health officials became very concerned at one point because thousands of people were so desperate they began venturing into the murky Maumee River. A river that even in 1936 was already considered a public health hazard for its stew of sewage and pollutants. Some health experts warned that long term exposure to the toxins and bacteria in the water could claim more lives than the drownings. The huge number of Toledoans that crowded the public pools was also a problem for it was feared that the filters couldn’t handle the pollution from the high number of bathers and that could also be a public health danger. Walbridge Park pool was recommended for closure, while city chemists worked to ascertain bacteria levels in the pools throughout the city. It wasn’t just the purity of the city’s water supply that came into question during this pressing heat wave of the 1930’s, but the supply and water pressure began dwindling. In downtown office buildings and hotels, many rooms on the upper floors of those buildings did not have water for days. Water restrictions were put in place and residents were warned not to use their lawn sprinklers or to use water needlessly. In the meantime, many residents had few options but just to do their best to move slowly and stay cool. Some began peeling off clothes, or sitting in front of fans, while others found that ice cream was an effective coolant. Ice cream parlors and beer joints in the city racked up record business. A few of the movie theaters in downtown Toledo, the Princess, the Valentine and the Rivoli all had air conditioning and were kept at a cool 70 degrees. Theater goers by the thousands flocked to what the NewsBee called the “Coolies” at these downtown venues. As the drought conditions began to take a firm grip on Toledo that summer of ’36, other areas of the Great Plains and the Upper Midwest were already reeling from the solar blight, dealing with crop failures and livestock starvation. From South Dakota to Texas, to the Eastern Seaboard, millions of acres of wheat and corn had been parched and lost, forest fires scorched the earth and hundreds of thousands of rural residents were left destitute and struggling. The Works Progress Administration, the WPA , reported at least 25,000 people were facing a lack of food and they were cutting red tape to get money to those affected. The newspaper stories of the heatwave also reminded us that heat can make strangers of us all. “Crazy from the Heat” was not just the title of a David Lee Roth Album. In nearby Sandusky, a man reportedly went berserk from the stress of the heat and went “out of his mind”. Police there say C.C. Lanley, 60 years old, was pushed beyond his limits of sanity. He shot his wife to death as she lie in bed, and then turned the gun on himself. In Erie, Pennsylvania, a 40 year old man on July 18th 1936, a few days after he had suffered heatstroke conducted a prayer service at his church and then went home and hammered to death his wife and two sons. Sam Weed then ran screaming outside and threw himself in front of a moving semi. The national death toll from the fierce heatwave of 1936 was about 5,000 when all was said and done, with over a billion dollars in crop losses to farmers, and hundreds of thousands taken ill during this extrordinary summer of discontent. It is was and is still considered the worst heatwave on record in U.S. history. And surprisingly it followed one of the coldest winters on record. While Toledo saw the mercury eclipse the 104 degree mark, other cities and regions coped with even hotter conditions. Okalhoma City experienced temperatures in excess of 120 degrees, as did parts of the Dakotas. Indiana’s high temp was 116 degrees and the residents of the little burg of Mio, Michigan dealt with 112 degrees on July 13th. Seventeen states broke or equaled their all time highest heat record that July. But…perhaps more interesting in hindsight, as we look back at the newspaper reports of the day was how our grand parents tried to keep life in the normal zone, despite dealing with the outrageous assault and nature’s attempt to kill everything and everyone. Many people, as it would appear, continued working, shopping, taking in events and picnics, or attending ball games. Generally going about their lives with a minimum of complaint, albiet with fewer layers of clothing, and a heavier layer of sweat. The Willow Beach Dance contest was won by a Mr. and Mrs. Howard Marvin of Defiance, hundreds of people turned out for the funeral and internment of former Toledo Congressman Warren Duffey and a crowd of city officials and businessmen turned out in 102 degree heat to inspect and tour the all-new modern New York Central “Mercury” locomotive on display at the Middlegrounds. The Lion Store had a sale on cotton frocks, a shopper’s luncheon at Petro’s in downtown Toledo was just 20 cents, and thousands of Toledoans were eagerly heading to the Stickney Avenue Showground where the Ringling Brothers Circus was featuring two shows a day. Life was hot. But life was still being lived. Maybe it says something about our grandparents who had not yet been spoiled by the cool comfort of air conditioning and the desire to live life at a constant 72 degrees. They seemed to roll with the punches and the hard times. Yeah, it was painfully hot, but life was always hard. Don’t expect anything less. Wonder how we, in this part of the country would deal with 110 degree temps today. Can’t help but think that life, as we know it, would stop. If our roads started blowing up, and the water supply dwindled to a trickle, and we suddenly lost our precious air conditioning? Would we have as much grit as Grandma and Grandpa who somehow seemed able and willing to forge a life and a future in the heat of hardship. I ponder that as I sit in my comfortable air conditioned office on this 90 degree day that is too hot for me to mow the lawn. The Curse of Bairdstown….truth or trifle? My kinfolk, the Santmires, were from Bairdstown, Ohio. Grandma Ethel grew up there and that’s how I know about the town. But if you have never heard of it or been there, you’re not alone. Bairdstown is not much more than a fly speck on the map, a tiny forgotten cluster of humanity, about six miles due east of North Baltimore that has seen its better days. But at one time, a hundred years ago or so, back in the oil-field era, Bairdstown was a boom town. A much bigger burg, once brimming with promise and prosperity. Two hotels, plenty of saloons, stores, a barrel factory, and a reputation as a wild brawling village in the center of a prosperous oil patch. As a result there were plenty of oil and refinery workers who made the small southern Wood County hamlet their home, along with the many farmers who also toiled in the fields of “corn and crude” in this oil-rich region of Southern Wood County. So rich it was, during that era, it was considered the oil capital of America. Hard to believe, but true. But it also turns out that many of these once thriving villages in this rural countryside were also rich in legend and lore. 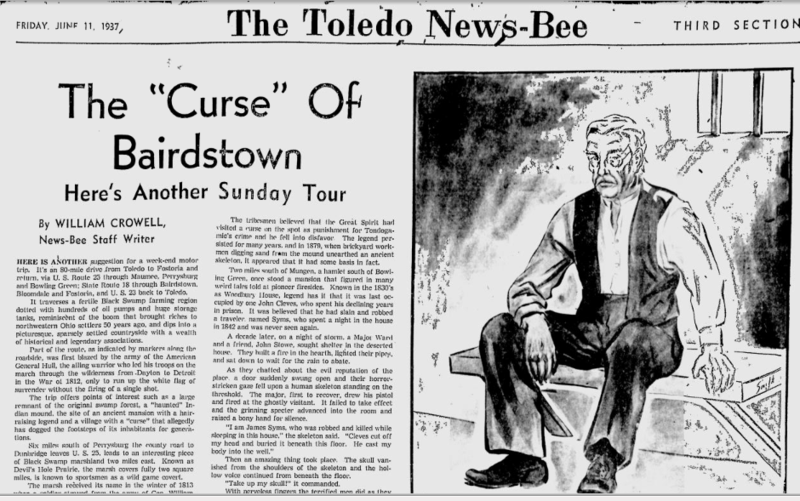 One of those legends is the “Curse of Bairdstown”. As the legend has it, Bairdstown’s fortunes, or lack thereof, may have been determined by one old resident who lived there long before the advent of oil. His name was Jim Slater, and he and his wife, had settled in the area sometime in the 1840’s. Slater bought a quarter section of land(a quarter square mile) to farm and worked hard, to make it go, but the hardships were too much to overcome. He seemed cursed. His corn died, his cattle wouldn’t give milk, and fortune was fickle. Slater not only struggled and remained poor, but his wife died in childbirth from the cruel realities of a primitive pioneer environment. Adding to Slater’s bad luck, were the rumors that not only was he a nervous and irritable man, but that he was mentally unstable and given to a quick and violent temper. As a result, he was not well liked among his neighbors and had few or no friends. It is not written as to how the townspeople reacted upon hearing Slater’s curse, but it wasn’t long until the bright promise of the little community began to dim. Josiah Baird, who built the town was also facing problems with his creditors. They were relentless in pursuing his debts and took him to court. Then his sons, it was said, began to develop bad habits and did not tend well to their father’s business. Baird’s flour mill was burned down, by persons unknown and his cattle in the fields became ill and died. Baird saw his hopes dwindle and his good fortune whither, and wondered in Slater’s curse was something to take seriously. Believing that he might be jinxed, he left the town that bore his name and moved his family to Arkansas. He took up hotel keeping, but within a short while, both his wife and daughter took ill and died. Baird returned to Ohio, but far away from Bairdstown and lived out his years in the southern part of the state. Meanwhile, George Strain, the man who was the prosecuting attorney in the criminal case against Jim Slater developed a serious mental disorder and was put in an insane asylum where he died. And David Hayes, Slater’s defense attorney, also met with the ill winds of misfortune as he too went broke and his wife and daughter died. Slater, himself, not long after, died in the infirmary, the poor house, at Bowling Green where he is buried in a Potter’s field. From those years forward, Bairdstown has never been able to get past the curse of Jim Slater. Misfortunes and fires have bedeviled the community over the years. In 1890, a train derailed on the B&O tracks in Bairdstown in February, resulting in several deaths. Then in July of that year, a series of mysterious fires, over a three-week period destroyed much of the Bairdstown business district. In 1894, a hold up occurred on the B&O Railroad between Deshler and Bairdstown, ending with the murders of two men aboard the train. Even during the boom years of the oil-field wealth, Bairdstown never quite blossomed, as did other towns nearby, but always found itself doomed by some tragedy. Today, it is not much more than an aging curiosity along Route 18 between North Baltimore and Bloomdale. A collection of older homes, a cemetery, a set of railroad tracks and a public park named for my great uncle, Merle Santmire. Who I might add, never believed in Jim Slater’s curse. Said he didn’t have the time to ponder what he regarded as a trifle. But some people around Bairstown at least consider the notion that Slater’s angry oath may have in fact been more than just the crabby words of a ranting old man. And I confess that I too have given it a thought or too, for despite Uncle Merle’s cynicism, his father, my great-grandfather, Amos Santmire, in 1898, at the age of 46, the father of ten children, including my grandmother, was struck and killed by a freight train on the edge of this little troubled town…..Bairdstown. The story of the black man’s entry into the ranks of American law enforcement really didn’t begin to materialize until little over a century ago in about the late 1800’s and the early 1900’s. Even then, the numbers of black Americans given the chance to wear a badge were still few and occurring mostly in the larger cities where black populations were large. In Toledo, for example, Albert King was the first black citizen hired to wear a Toledo Police badge in about 1900. In the smaller communities of the area, minority police officers were non existant at the time, and in many rural towns, they still are. BEN STONE MAKES HIS HIS MOVE INTO TOWN. 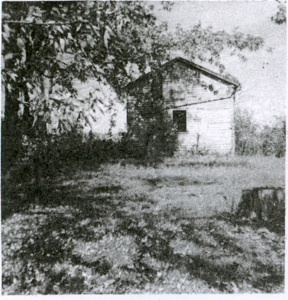 Eventually, in 1916, Ben tired of the farming life and sold off 40 acres of his land to a neighbor, but kept the old cabin and the other forty acres where he lived. He also took a few odd jobs working for other farmers in the area. His solid reputation for hard work and honesty paid other dividends when he took a full time job as the night watchman for the Schwan Furniture store and funeral home in Luckey, guarding the business from the growing number of depression era criminals who roamed the area looking for things to steal. A few other merchants also paid Ben to watch their stores at night and soon he was officially appointed as the town marshal. With that designation he was allowed to carry and gun and he patrolled Luckey’s streets at night with a flashlight in one hand and a shotgun in the other. He also tucked a .45 caliber handgun into the side of his well worn and shaggy coveralls that was his familiar uniform. It can be stated that Ben was hardly a student of modern fashion. His unshaven and grizzly face and his disheveled appearance, were not helped by his refusal to wear a glass eye after he had lost one in an accident many years before. His reason for not wearing the glass eye, he said, was that “it doesn’t make me see any better”. Ben was clearly a man of modest needs and means. After selling his cabin and the remaining 40 acres in the country, he eventually made his home in the back storeroom of the old Schwan Furniture store and where his bed was fashioned from empty wooden boxes used for burial vaults. Locals say Ben would have made a good character for a movie. And if ever there was a great opening scene, it might have been written about the quiet autumn day in 1933 when this mild mannered and friendly marshal became a real-life action hero. As the tale is told from the 1981 Luckey Centennial history book, the story unfoldedThursday afternoon, September 28 in 1933. John Landwehr who worked at the Schwan furniture store, was washing the front windows when he noticed a man walk toward the Luckey Exchange Bank wearing a hunting coat. Another man was sitting in a parked car, acting nervously, on the street nearby. Sensing something wasn’t right, Landwehr and his sister ran to the backroom of the furniture store to awaken Marshal Stone who had been up all night patrolling the streets. When informed of what might be happening at the bank, Ben promptly rolled out of bed, put a six shooter in each pocket, and picked up a double barreled shotgun loaded with buckshot. That’s when Ben Stone says he heard “two cracks” from the robber’s gun and then felt something “nip” his legs” and “That’s when I let him have the right barrel and he went down in a heap.” Someone then shouted that the robber was going to fire again, at which point, Ben not only fired the other barrel at the robber, but then pumped three more bullets into him from his pistol. As soon as the gunfire erupted, the other man in the getaway car took off and Ben would recall later” I’m pretty sorry I didnt get him too.” He was later caught and sent to prison. By this time, the normally quiet downtown main street in Luckey was flooding with people who came to view the aftermath of this violent bank robbery that ended badly for the suspect as he lay mortally wounded bleeding profusely from his wounds, while Marshal Stone dealt with the pain and bleeding from two bullet holes in his legs. One of the people who came to town that day to witness the scene, was LaVeda Graening, who was a teenager at the time. Now in her nineties, and living in Perrysburg, she told me recently, what she remembers of that day as the crowd gathered around the dead bank robber sprawled out on the bloody street. ” My cousin called me and told me what was happening and I ran as fast as I could to get there. The streets were filled with people and people gathered around to see someone shot in the street. It was so public…seeing a body there. Just out in front of everybody. I don’t want to be too descriptive, but when they took his short off, you know, you could see the wound in his chest. It was awful”. Laveda Graening’s remembrances of the Luckey’s most famous lawman are shared by many. The legacy of this man remains indelibly etched into the historical accounts of the Wood County community as a local hero. 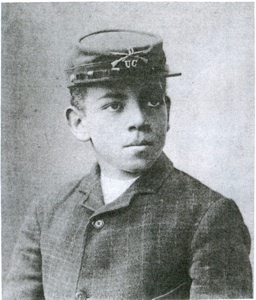 An unlikely and unusual embrace of a black man in the lily-white farm country of Wood County made up predominantly German and Swiss ancestry at a time when racial prejudice was still practiced openly in many communities. The open warmth that was shown to Ben during this era says a lot about the people of Luckey and says a lot about character of Ben Stone and the effect he had on the people of the community. “He was my Dad’s best friend”, LaVeda Graening recalls, and she tells of how Ben’s “bunkhouse” or quarters, where he used to sleep at night in the back of the mortuary, often became a social gathering place for the men of the town who would get together on a Saturday morning to tell stories over a pot bellied stove. 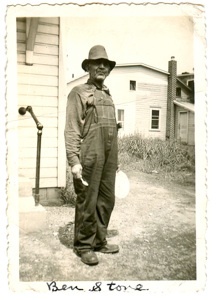 Ben, who was regarded as “town character” often took his share of good natured ribbing from some of the men in town about his dress, his bib overhauls and and his happy-go-lucky lifestyle, but Ben, it is written, always took it in good stride and laughed with those who make the jokes. After the bank robbery and shooting in 1933, the townspeople of Luckey took Ben a little more seriously. Appreciative of the fact, that he had put himself in harms way to protect the town and residents, the citizens found a new sense of respect for Marshal Stone. In November of 1933, few months after the shooting, Ben Stone was the guest of honor at a testimonial dinner at the Grace Lutheran Church in Luckey where 160 of his fellow townspeople thanked him for his courage and service to the town and presented him with a new gold deputy sheriff’s badge with his name engraved on the back of it. They also presented him with a check for 150 dollars. Another gift Ben received was surprising and offered a strange twist to the bank robbery saga. It was a letter of thanks from the mother of Glenn Saunders, the bank robber that he had shot dead. Mrs. Saunders of Columbus Grove, thanked Ben for killing her son, saying he had always been trouble and she and her husband were relieved that he wouldn’t be causing anymore trouble. She continued her communication with Ben over the years and they often exchanged Christmas gifts. Ben continued his duties for the next decade in his adopted home of Luckey, patrolling the streets, with his guns tucked into the bib overhauls and greeting his friends and residents everyday with a familiar smile. After the shooting however, he had to give up riding his bicycle because of the wounds he sustained in the shoot-out. He sold it a young girl in town, Betty Landwehr, who had become one of his “Ain-gies” or Angels. Her mother paid for the bike with10 dozen cookies, delivered over a period of time. Betty rode the bike for many years before heading off to Bowling Green to college. 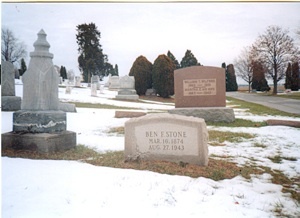 Betty lives now in Florida and has very fond memories of Ben Stone as do most of those fortunate enough to have known him. When Ben died on August 27th, 1943, of heart disease, at the age of 69, staying true to his simple desires of life, his remains were cremated, and his ashes spread over the Webster Township Cemetery at Scotch Ridge. Today one can find a grave marker among the those of the other families and settlers of the area. And while the old dirty boots of Ben Stone no longer walk the streets of Luckey protecting its citizens at night, the footsteps of this young orphaned boy who found a home can be heard in the winds of time. As the Great Depression neared its peak in 1933, farmers across the country were in great peril. Many were losing everything as their farms were sold out from under them in foreclosure actions to large financial lenders. It was an all too common and tragic story for many proud and long-time farm families who faced financial ruin. But in Wood County, Ohio, farmers figured out a way to foil the big banks so that some farmers would get a second chance. It was called the “penny auction”, and the first one unfolded 77 years ago this week on the farm of Wallace Kramp near Bowling Green in Wood County. Owing some $800.00 on his mortage to the bank and unable to pay, Kramp was foreclosed upon and a sheriff’s sale was set up to auction off his equipment, livestock and land. But some crafty local farmers had a plan to save Kramp’s farm. About 700 local farmers showed up for the auction that day on January 26, 1933 and when the bidding started, they bid only a few pennies on each item and would not allow anyone else to offer more serious bids. The sheer size and mood of the crowd kept many would-be bidders from offering more realistic bids, so when the finally tally came on that day at Wallace Kramp’s farm, the farmers had bid a total of only $14.00. Not nearly the hundreds, or thousands of dollars the bank had hoped to reap that day. The farmers then told Kramp…he could have all the items back for a 99 year lease for a penny. auctions” spread quickly and newspapers from around the country carried the stories. 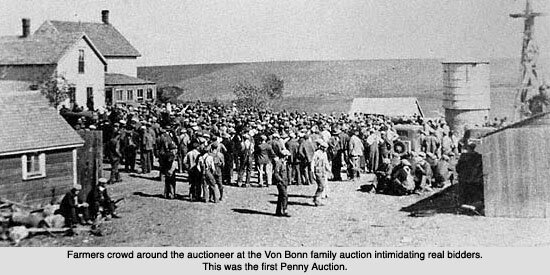 Within weeks, that one simple and daring act of defiance that began in Wood County fired the determination of others and those “penny auctions” were soon being carried out in other areas of the country.